هاشمی پناه, امین, رفیعی, غلامرضا, نیکبخت, احسان, بزرگی, سپیده. (1397). تاثیر آرتمیای غنی شده با دو پروبیوتیک باسیلوس سابتیلیس و پدیوکوکوس پنتوساسئوس بر شاخص های رشد و بقا و ترکیبات لاشه پست لارو میگوی پا سفید غربی (Litopenaeus vannamei). فصلنامه محیط زیست جانوری, 10(2), 239-244. امین هاشمی پناه; غلامرضا رفیعی; احسان نیکبخت; سپیده بزرگی. "تاثیر آرتمیای غنی شده با دو پروبیوتیک باسیلوس سابتیلیس و پدیوکوکوس پنتوساسئوس بر شاخص های رشد و بقا و ترکیبات لاشه پست لارو میگوی پا سفید غربی (Litopenaeus vannamei)". 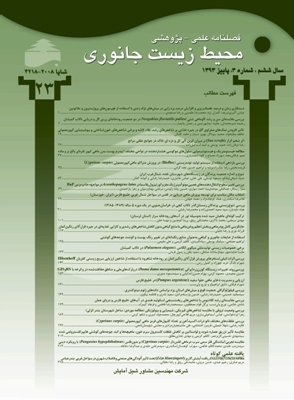 فصلنامه محیط زیست جانوری, 10, 2, 1397, 239-244. هاشمی پناه, امین, رفیعی, غلامرضا, نیکبخت, احسان, بزرگی, سپیده. (1397). 'تاثیر آرتمیای غنی شده با دو پروبیوتیک باسیلوس سابتیلیس و پدیوکوکوس پنتوساسئوس بر شاخص های رشد و بقا و ترکیبات لاشه پست لارو میگوی پا سفید غربی (Litopenaeus vannamei)', فصلنامه محیط زیست جانوری, 10(2), pp. 239-244. هاشمی پناه, امین, رفیعی, غلامرضا, نیکبخت, احسان, بزرگی, سپیده. تاثیر آرتمیای غنی شده با دو پروبیوتیک باسیلوس سابتیلیس و پدیوکوکوس پنتوساسئوس بر شاخص های رشد و بقا و ترکیبات لاشه پست لارو میگوی پا سفید غربی (Litopenaeus vannamei). فصلنامه محیط زیست جانوری, 1397; 10(2): 239-244. استفاده از پروبیوتیک ­ها در آبزی ­پروری نشان داده است که می ­تواند بهره ­وری بیش­ تری را در این صنعت ایجاد کند. با این هدف، در این تحقیق اثر استفاده از دو گونه باکتریایی باسیلوس سابتیلیس و پدیوکوکوس پنتوساسئوس به عنوان پروبیوتیک روی شاخص­ های رشد، بقا و ترکیبات بیوشیمیایی لاشه پست لارو میگوی وانامی بررسی شد. به این منظور تعداد سه تیمار آزمایشی، هر کدام سه تکرار شامل تیمار باسیلوس (B)، تیمار پدیوکوکوس (P) و تیمار تلفیقی باسیلوس و پدیوکوکوس (BP) از طریق غنی ­سازی آرتمیا مورد مصرف لاروهای میگوی وانامی از مرحله مایسیس III تا مرحله 15PL قرار گرفتند. به­ عنوان تیمار شاهد نیز از آرتمیای غنی نشده با پروبیوتیک برای تغذیه لاروها استفاده شد. در پایان آزمایش نتایجشاخص ­های رشد و بقا یک روند افزایشی تحت تاثیر مصرف پروبیوتیک را به ­طور معنی­ داری (0/05>P)نشان دادند و بیش ­ترین تاثیر آن نیز در تیمار تلفیقی نمود پیداکرد. اما در رابطه با تاثیر مصرف پروبیوتیک­ ها بر فاکتورهای بیوشیمیایی لاشه میگونتایج اختلاف معنی­ داری را میان تیمارهای مختلف نشان ندادند. در پایان با توجه به نتایج کسبشده در این آزمایش می ­توان گفت که باکتری ­های مذکور به ­عنوان پروبیوتیک توانستند از لحاظ ارتقا رشد و بهبود بهره­ وری تولید پست لارو میگوی وانامی تاثیرگذار باشند بدون این ­که تاثیر به ­خصوصی رویفاکتورهای بیوشیمیایی بدن بگذارند. احمدی، س.، 1393. مقایسه تاثیر پروبیوتیک پدیوکوکوس اسیدی لاکتیسی و لاکتوکوکوس لاکتیس بر شاخص ­های رشد، بقا و فعالیت­ های آنزیمی میگوی پاسفید غربی (Litopenaeus vannamei). رساله دکتری، شیلات، دانشکده کشاورزی و منابع طبیعی، دانشگاه آزاد اسلامی واحد علوم تحقیقات. 125 صفحه. مصلحی، ف.؛ ستاری، م.؛ خوش­ خلق، م.ر.؛ شناورماسوله، ع.ر. و عباسعلی ­زاده،ع.ر.،1393. اثر پروبیوتیک پدیوکوکوس پنتوساسئوس (Pediococcus pentosaceus)بر عوامل رشد و ایمنی تاس ­ماهی سیبری (Acipenser baerii). مجله علوم و فنون شیلات. دوره 3، شماره 4، صفحات 81 تا 92. AOAC (Association of Official Analyatical Chemists). 1998. Official Methods of Analysis, 16 ͭ ͪ ed. AOAC, Washington, DC, USA. 1141 p.
Boonthai, T.; Vuthiphandchai, V. and Nimrat, S., 2011. Probiotic bacteria effects on growth and bacterial composition of black tiger shrimp (Penaeus monodon). Aquac. Nutr. Vol. 17, pp: 634-644. Campbell, R.; Adams, A.; Tatner, M.F. ; Chair, M. and Sorgeloos, P., 1993. Uptake of Vibrio anguillarum vaccine by Artemia salina as a potential oral delivery system to fish fry. Fish Shellfish Immun. Vol. 3, pp: 451-459. Castex, M.; Chim, L.; Pham, D.; Lemaire, P.; Wabete, N.; Nicolas, J.L. ; Schmidely, P. and Mariojouls, C., 2008. Probiotic P. acidilactici application in shrimp Litopenaeus stylirostris culture subject to vibriosis in New Caledonia. Aquaculture. Vol. 275, pp: 182-193. Dixon, B.A. ; Van Pucke S.O. ; Chair, M.; Demasque, M.; Nelis, H.J. ; Sorgeloos, P. and De Leenheer, A.P., 1995. Bioencapsulation of the antibacterial drug safrafloxacin in nauplii of the brine shrimp Artemia franciscana. J. Aquat. Anim. Health. Vol. 7, pp: 42-45. Ergun, S.; Yigit, M. and Turker, A., 2003. Growth and feed consumption of young rainbow trout exposed to different photoperiods. Israeli journal of Aquaculture, Bamidge. Vol. 55, No. 2, pp: 132-138. Fernandez, R.; Sridhar, M. and Sridhar, N., 2011. Effect of lactic acid bacteria administered orally on growth performance of Penaeus indicus (H. Milne Edwards) juveniles. Res J Microb. Vol. 6, pp: 466-479. Fuller, R., 1989. Probiotics in man and animal. J. Appl. Bacteriol. Vol. 66, pp :365-378. Gatesoupe, F.J., 1994. Lactic acid bacteria increase the resistance of turbot larvae, Scophthalmus maximus, against pathogenic Vibrio. Aquat. Living Resour. Vol. 7, pp: 277-282. Gatesoupe, F.J., 1999. The use of probiotics in aquaculture. Aquaculture. Vol. 180, pp: 147-165. Hai, N.V.; Buller, N. and Fotedar, R., 2009b. The use of customised probiotics in the cultivation of western king prawns. Fish Shellfish Immunol. Vol. 27, pp: 100-104. Hai, N.V.; Buller, N. and Fotedar, R., 2010b. Encapsulation capacity of Artemia nauplii with customised probiotics foruse in the cultivation of western king prawns (Penaeus latisulcatus). Aquac. Res. Vol. 41, pp: 893-903. Irianto, A. and Austin, B., 2002. Probiotics in aquaculture. J. Fish Dis. Vol. 25, pp: 633-642. Jamali, H.; Imani, A.; Abdollahi, D.; Roozbehfar, R. and Isari, A., 2015. Use of Probiotic Bacillus spp. in Rotifer (Brachionus plicatilis) and Artemia (Artemia urmiana) Enrichment: Effects on Growth and Survival of Pacific White Shrimp, Litopenaeus vannamei, Larvae. Probiotics and Antimicro. Prot. Vol. 7, pp: 118-125. Li, P.; Burr, G.S. ; Goff, J.; Whiteman, K.W. ; Davis, K.B. ; Vega, R.R. ; Neill, W.H. and Gatlin, D.M., 2005. A preliminary study on the effects of dietary supplementation of brewers yeast and nucleotides, singularly or in combination, on juvenile red drum (Sciaenops ocellatus). Aquac. Res. Vol. 36, pp: 1120-1127. McIntosh, D.; Samocha, T.M. ; Jones, E.R. ; Lawrence, A.L. ; McKee, D.A. ; Horowitz, S. and Horowitz, A., 2000. The effect of a commercial bacterial supplement on the high-density culturing of Litopenaeus vannamei with a low-protein diet in an outdoor tank system and no water exchange. Aquac. Eng. Vol. 21, pp: 215-227. Montero, D.; Mathlouthi, F.; Tort, L.; Afonso, J.M. ; Torrecillas, S.; Fernandez-Vaquero, A.; Negrin, D. and Izquierdo, M.S., 2010. Replacement of diatary fish oil by vegetable oils affects humoral immunity and expression of pro-inflammatory cytokines genes in gilthead sea bream (Sparus aurata). Journal of Fish and Shellfish Immunology. Vol. 29, pp: 1073-1081. Moriarty, D.J.W., 1998. Control of luminous Vibrio species in penaeid aquaculture ponds. Aquac. Vol. 164, pp: 351-358. Newaj-Fyzul, A.; Adesiyun, A.A.; Mutani, A.; Ramsubhag, A.; Brunt, J. and Austin, B., 2007. Bacillus subtilis AB1 controls Aeromonas infection in rainbow trout. J. Appl. Microbiol. Vol. 103, pp: 1699-1706. Patra, S.K. and Mohamed, K.S., 2003. Enrichment of Artemia nauplii with the probiotic yeast Saccharomyces boulardii and its resistance against a pathogenic Vibrio. Aquaculture International. Vol. 11, pp: 505-514. Rengpipat, S.; Phianphak, W.; Piyatiratitivorakul, S. and Menasveta, P., 1998a. Effects of a probiotic bacterium on black tiger shrimp Penaeus monodon survival and growth. Aquaculture. Vol. 167, pp: 301-313. Rollo, A.; Sulpizio, R.; Nardi, M.; Silvi, S.; Orpianesi, C. and Caggiano, M., 2006. Live microbial feed supplement in aquaculture for improvement of stress tolerance. Fish Physiol. Biochem. Vol. 32, pp: 167-177. Saad, S.A.; Habashy, M.M. and Sharshar, M.K., 2009. Growth response of the freshwater prawn, Macrobrachium rosenbergii (De Man), to diets having different levels of Biogen. World Appl. Sci. J. Vol. 6, pp: 550-556. Silva, E.F.; Soares, M.A. ; Calazans, N.F. ; Vogeley, J.L. ; Do Valle, B.C. ; Soares, R. and Peixoto, S., 2013. Effect of probiotic (Bacillus spp.) addition during larvae and postlarvae culture of the white shrimp Litopenaeus vannamei. Aquac. Res. Vol. 44, pp: 13-21. Standen, B.T. ; Rawling, M.D. ; Davies, S.J. ; Castex, M.; Foey, A. and Gioacchini, G., 2013. Probiotic Pediococcus acidilactici modulates both localized intestinal- and peripheral-immunity in tilapia (Oreochromis niloticus). Fish Shellfish Immunol. Vol. 35, No. 4, pp: 1097-104. Thanh Tung, H.; Koshio, S. and Traifalgar, R.F., 2010. Effects of Dietary Heat-killed Lactobacillus plantarum on Larval and Post-larval Kuruma Shrimp, Marsupenaeus japonicus Bate. World Aquacul Society. Vol. 41, pp: 16-27. Venkat, H.K. ; Sahu, N.P. and Jain, K.K., 2004. Effect of feeding lactobacillus based probiotics on the gut micro flora, growth and survival of post larvae of Macrobranchium reosenbergii. Aquaculture Res. Vol. 35, pp: 501-507. Verschuere, L.;Rombaut,G. ;Sorgeloos,P.and Verstraete, W., 2000. Probiotic bacteria as biological control agents in aquaculture. Microbiol. Mol. Bio. Rev. Vol. 64, pp: 655- 671. Villamil, L.; Reyes, C. and Martınez-Silva, M.A., 2014. In vivo and in vitro assessment of Lactobacillus acidophilus as probiotic for tilapia (Oreochromis niloticus, Perciformes: Cichlidae) culture improvement. Aqua. Res. 45, pp: 1116-1125. Wang, Y.B. and Xu, Z.R., 2006. Effect of probiotics for common carp (Cyprinus carpio) based on growth performance and digestive enzyme activities. Anim. Feed Sci. Technol. Vol. 127, pp: 283-292. Wang, Y.B., 2007. Effect of probiotics on growth performance and digestive enzyme activity of the shrimp Penaeus vannamei. Aquaculture. Vol. 269, pp: 259-264. Watanabe, T.; Kitajima, C. and Fujita, S., 1983. Nutritional values of live organisms used in Japan for mass propagation of fish: a review. Aquacul. Vol. 34, pp: 115-143. Yang, H.G. ; Liu, Y.J. ; Tian, L.L. ; Liang, Y.G. and Lin, H.R., 2010. Effects of supplemental Lysin and Methionine on Growth Performance and body compsosition for Grass Carp (Ctenopharyngodon idella). Agricultural and Biological. Vol. 5, No. 2, pp: 222-227. Yu, M.C. ; Li, Z.J. ; Lin, H.Z. ; Wen, G.L. and Ma, S., 2009. Effects of dietary medicinal herbs and Bacillus on survival, growth, body composition, and digestive enzyme activity of the white shrimp. Aquaculture Int. Vol. 17, pp: 377-384. Zhou, X.X. ; Wang, Y.B. and Li, W.F., 2009. Effect of probiotic on larvae shrimp (Penaeus vannamei) based on water quality, survival rate and digestive enzyme activities. Aquaculture. Vol. 287, pp: 349-353. Ziaei-Nejad, S.; Rezaei, M.H. ; Takami, G.A. ; Lovett, D.L. ; Mirvaghefi, A.and Shakouri M., 2006. The effect of Bacillus spp. bacteria used as pro-biotics on digestive enzyme activity, survival and growth in the Indian white shrimp Fenneropenaeus indicus. Aquaculture. Vol. 252, pp: 516-524.